Hyorim Han’s performance experience includes appearances in the 2004 Summit Music Festival Recital of New York, the Kumho Recital in Seoul in 2004, the 2003 Kumho Prodigy Recital in Seoul, and the 2002 Changwon Young Artist Recital in Changwon. Recent solo engagements include appearances with the internationally renowned Korean Broadcasting System Orchestra, the LG Music Festival, the Prime Philharmonic Orchestra in Seoul, the Seoul Philharmonic Orchestra, the New Seoul Philharmonic Orchestra, the Changwon Philharmonic Orchestra, and the Taegu Philharmonic Orchestra. Han has studied with Nam-Yun Kim, Won-Mo Kim, Ko Woon Yang, and Burkhard W. Godhoff. Han has received many awards including: Daugu Broadcasting Corporation Competiton 1st prize 2000, Changwon Art Festival 2001, the Haneol Music Competition 2001, Ewha&kyunghyang Music Competition Seoul 2nd prize 2002, and the Summit Music Festival Competition 2003. 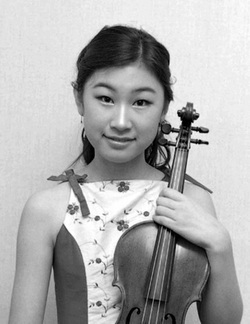 Han is currently a student at the Curtis Institute of Music in Philadelphia. She is currently studying with Ko-Woon Yang, Aaron Rosand, and Victor Danchenko.